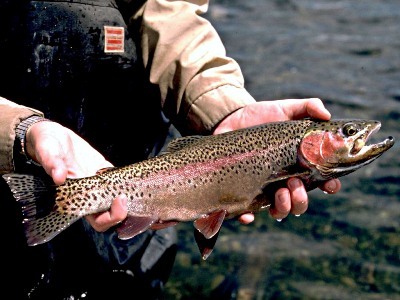 The rainbow trout (Oncorhynchus mykiss) is one of the world’s most recognizable gamefish. In North America, this iconic fish occurs in many forms, including landlocked and sea-run wild trout, hatchery-produced stocked fish, and farm-raised fish. Rainbow trout are named for the reddish stripe along their sides. Mature males in the spawning phase have pronounced red stripes. Females are less dramatic in coloration. The body is usually dark on top with silver flanks and lighter undersides. The redband trout is a subspecies of rainbow trout, historically found east of the Cascade Mountains. In California, three subspecies of rainbow trout are known collectively as golden trout: Kern River rainbow trout, Little Kern golden trout, and California golden trout. Ocean-going forms of rainbow trout are known as steelhead. Native to the Pacific Coast drainages, steelhead have been introduced successfully into the Great Lakes and other areas. The golden rainbow trout is a colorful variation of hatchery-produced trout developed through selective breeding.